Peoples Screen from Paul Sermon on Vimeo. 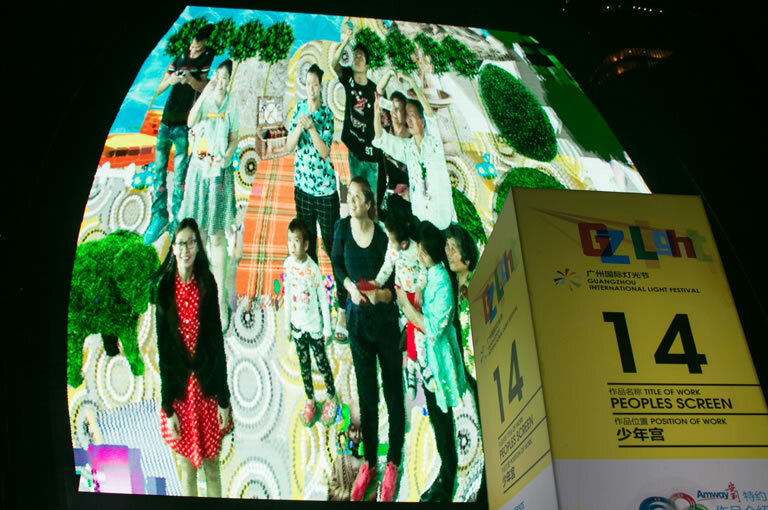 In November 2015 Public Art Lab commissioned a new version of Occupy the Screen for the Guangzhou Light Festival in China. Sharing the same time zone, the installation was connected for 12 evenings with the Northbridge Piazza public video screen in Perth Australia and was extensively reworked to converge scenes from the cities of Guangzhou and Perth. Renamed Peoples Screen, the installation was hugely popular, involving over 25,000 participants in Guangzhou alone. Peoples Screen offered public audiences in Guangzhou and Perth the opportunity to co-create chance encounters and self direct spontaneous performances between these cities. These unique transitory events rely entirely on the roles and performances the local communities bring to these urban screens and the experiences they choose to live out. Inspired by their urban and cultural surroundings and re-contextualized in a diverse array of digital milieus, ‘Peoples Screen’ aims to allow these public audiences the agency to reclaim their urban screens akin to a telepresent fluxus happening.